From Nuclein to the Double Helix -- The Scientists who Discovered DNA — Science Delivered! DNA holds the key to all life as we know it. From the smallest bacterium to the massive blue whale, deoxyribonucleic acid encodes the vast complexity of life through the unique arrangements of four simple nucleotides: adenine (A), thymine (T), cytosine (C), and guanine (G). The difference between all species on the tree of life trace back to differing combinations of those four letters: A, T, C, and G. The variation in these arrangements allows life on Earth to flourish in the deep oceans, dark jungles, blue skies, and every space in between. Humans and chickens share 60% of their genes , humans and cats share 90% , and humans and chimpanzees share 96% of their entire DNA sequence . The color of your hair, how tall you are, even whether or not you like cilantro, all are determined by the arrangements of DNA inherited from your parents. However, for centuries, the hereditary material responsible for passing along these traits eluded scientist and philosophers alike. The human genome holds approximately 2.4 billion base pairs, yet only about 0.1% of that is estimated to provide all of the genetic variation between humans . Great success is rarely achieved alone; often times it takes groups of people, each 0.1% different, to achieve the extraordinary. Artists have their muses. Composers have their orchestras. Astronauts have Ground Control. Scientists have their collaborators. With 2018 marking the 65th anniversary of Watson and Crick’s discovery of the famous double helix structure of DNA, we should look back at the people and lessons involved in the quest to discover and characterize this most important of molecules. James Watson and Francis Crick may be the most recognizable names associated with DNA research, yet many other scientists laid the groundwork for understanding DNA as we know it. While there are far too many people and events to thoroughly catalogue, recounting the stories a few of the lesser known names can help us understand how scientists came to discover and characterize DNA, all while providing lessons that remain pertinent to this day. Friedrich Miescher was a Swiss ‘physiological chemist’ in the late 19th century. In an era when many biological principles were being established, science was shifting from looking at whole organisms or systems towards focusing on their component molecules and cells. Additionally, the concept of evolution and inheritance began garnering attention through the works of those such as Charles Darwin and Gregor Mendel. Miescher was interested in finding the “fundamental principles of the life of cells” , and began investigating the composition of human white blood cells. In 1866, while characterizing the composition of these cells, Miescher identified a substance that was neither protein nor lipid, rather something novel that he termed “nuclein”. Overcoming technical limitations and carefully modifying experiments to suit this new substance, Miescher eventually isolated enough material for him to roughly characterize nuclein as a novel entity “not comparable to any hitherto known group” . He was the first person to isolate what would soon become known as DNA. The four nucleotides of DNA. Image by Adam Greene. In the following years, Miescher eventually found nuclein to be within the sperm of many animals, from fish to frogs to bulls. However, many remained skeptical of his work. This was compounded by the fact that Miescher published only a few papers during his career, opting to discuss ideas through personal communications with friends, family, and colleagues. Fortunately, due to his diligent note-taking and well-articulated protocols, others were able to confirm his finding within their own investigations, and eventually, nuclein was appreciated as a novel substance within cells. Still, Miescher doubted that nuclein was hereditary material, believing it was too simple to provide the complex variation of life. Following the work of Miescher, many scientists sought to characterize the newly-named DNA. One such scientist was Phoebus Levene. Born in what is now Lithuania, Levene was trained as a physician and chemist in Russia and New York. However, he spent much of his time traveling to various institutions across the world to learn new techniques and study with different groups. As a biochemist, Levene sought to understand the role of DNA within cells and understand the relationship of nucleic acid between organisms. At the time he began DNA research, scientists understood little more than the rough chemical composition of nucleic acids. 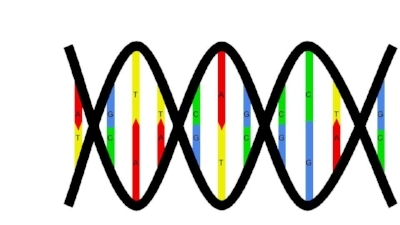 By adapting to the technological limitations of the early 1900s, Levene established the empirical formula of nucleic acids (C38H50O29N15P4), and in 1929 identified the four base nucleotides of RNA: adenine, cytosine, guanine, and uracil (thymine in DNA was found shortly after) . Unfortunately, Levene is probably best known as the founder of the tetranucleotide hypothesis, which suggested that nucleic acids were found in repeating cycle of subunits wherein all bases were equally represented. While we now know that DNA varies greatly in length and nucleotide composition between species, at the time, the tetranucleotide hypothesis became ingrained in the field, stagnating interest and research into the functionality of DNA within the cell. The Griffith Experiment which definitively showed that DNA was the hereditary material. Image by Adam Greene. Early in the 1930s, scientists were still seeking to identify the hereditary material of life. The tetranucleotide hypothesis presumed nucleotides could not encode the complexity of life, leading many to doubt the role of DNA in inheritance. In 1928, Frederick Griffith sought to determine how two different morphologies of Streptococcus pneumoniae bacteria develop differing characteristics and understand how those traits affect disease . Scientists understood that ‘smooth’ bacteria would lead to pneumonia and death in mice, while ‘rough’ shaped bacteria were harmless (nonvirulent). Griffith co-infected mice with both live, nonvirulent bacteria and a heat-killed dose of virulent bacteria, expecting to recover only the non-virulent bacteria. Surprisingly, co-infection caused pneumonia in mice from which live, virulent bacteria with the ‘smooth’ shape could be recovered [7,8]. From this experiment, Griffith determined that the nonvirulent bacteria must have taken up a “transforming principle”, acquiring virulence and morphological traits from the heat-killed ‘smooth’ bacteria. Nonetheless, many continued to presume protein held the genetic information of cells and provided the “transforming principle”. However, in 1944, Oswald Avery, Colin MacLeod, and Maclyn McCarty teamed together to isolate and characterize Griffith’s transformation principle. Their findings left only one conclusion: DNA was the transforming principle. Together, the works by Griffith and the Avery group discovered that DNA, not protein, encoded the traits that transferred between bacterial strains . For the first time, scientists understood the role of DNA: storing the genetic information of life. Yet scientists didn’t fully grasp the importance of this finding. Instead of celebrating discovering the molecular basis of life, the response was restrained, almost skeptical. It seemed impractical for the vast complexity of life to be encoded by four simple nucleotides. Proteins were more thoroughly investigated; they were much more varied in form and function, so it seemed logical that proteins comprised the hereditary information of life. However, in 1952 Alfred Hershey and Martha Chase finally resolved any remaining doubt. Using viruses that infect bacteria, Hershey and Chase were able to detect which viral components were required for self-replication. Through careful isolation of protein and DNA, they were able to show that protein was unnecessary for viral replication; rather, the DNA was “injected” into the bacterium where it was copied and packaged into progeny virus [8-10]. Once and for all, scientists demonstrated that protein has no involvement in passing genetic information between generations. DNA encodes the secrets to life. Within a year of this finding, the work by Rosalind Franklin, Maurice Wilkins, James Watson, and Francis Crick revealed the structure of DNA and all the pieces of the puzzle were in place. Only four years later, in 1957, Francis Crick established the central dogma, in which DNA is transcribed into RNA and subsequently translated into protein. Finally, we understood the incredible importance of DNA. Within 90 years, science had gone from identifying the novel, mysterious “nuclein” to understanding how DNA encodes the genetic information of life as we know it. These discoveries did not just occur by accident. They were the product of hard work and the circumstances surrounding these pioneering scientists. Despite the technological limitations of the late 1800s, Friedrich Miescher was a rigorous investigator, diligently repeating his experiments and analyzing his conclusions. Since he was a poor public communicator of his data, his rigorous note taking and experimental design allowed for others to repeat his works and champion their importance. After all, research is critical to understanding how the world works. It allows us to see how things truly are so that we may better understand and benefit from our surroundings. So what good is knowledge if we do not share it for others to use? Griffith, Avery, McCarty, and MacLeod all worked on the transforming principle of life, but each approached it from different perspectives. Griffith was interested in the epidemiological implications for virulence transfer within Streptococcus strains, whereas the Avery group continued in his footsteps from a strictly biochemical point of view. Together, their combined works were able to discover something incredible, that DNA alone can transfer traits between cells, leading to changes in shape and even the ability to cause disease. Despite lingering skepticism , Hershey and Chase continued researching inheritance, conclusively showing that DNA is passed down from parental to progeny virus. Individually, any one study incrementally improves our understanding of life; however, their stories together hold a sum greater than their parts. Phoebus Levene traveled the world, inserting himself into different cultures and institutions. This broad exposure allowed him to assimilate many cultural and scientific ideas into his work, helping him compose important questions leading to important findings. His story also serves as a cautionary tale. Incomplete information can be dangerous; not only does it leave out important details, but it can also serve to promote incorrect conclusions and halt future progress in uncovering the truth. Today it remains critical that we seek out all of the available information and withhold judgement until all of the facts are known. Too often we jump to the first and easiest conclusion, yet often the truth takes effort to discover. The story of DNA beautifully demonstrates this. It took a number of scientists rejecting assumptions. It took cooperation, diligence, hard work, and dedication to finally understand how DNA shapes life as we know it. Rarely does one person alone change the world. Often, incredible accomplishments take many people with unique experiences and skills, each 0.1% genetically different, working together to accomplish something truly special. Pontius JU, et al. ; Agencourt Sequencing Team; NISC Comparative Sequencing Program (2007) Initial sequence and comparative analysis of the cat genome. Genome Res, 17: 1675–1689. Dahm, R. (2005) Friedrich Miescher and the discovery of DNA. Dev Biol, 278(2): 274-288. For a highly informative timeline of DNA discovery, check out “Friedrich Miescher and the discovery of DNA” by Ralf Dahm (reference 5).